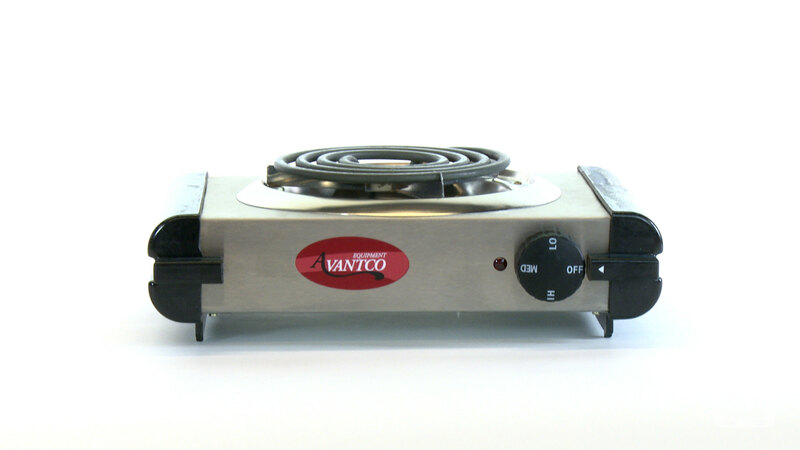 Perfect for buffet tables and catered events, this Avantco EB100 countertop range features a 1000 watt thermostatically controlled burner. Its cool touch end panels protect against accidental burns, making the Avantco EB100 single burner buffet range an ideal fit for self serve applications. 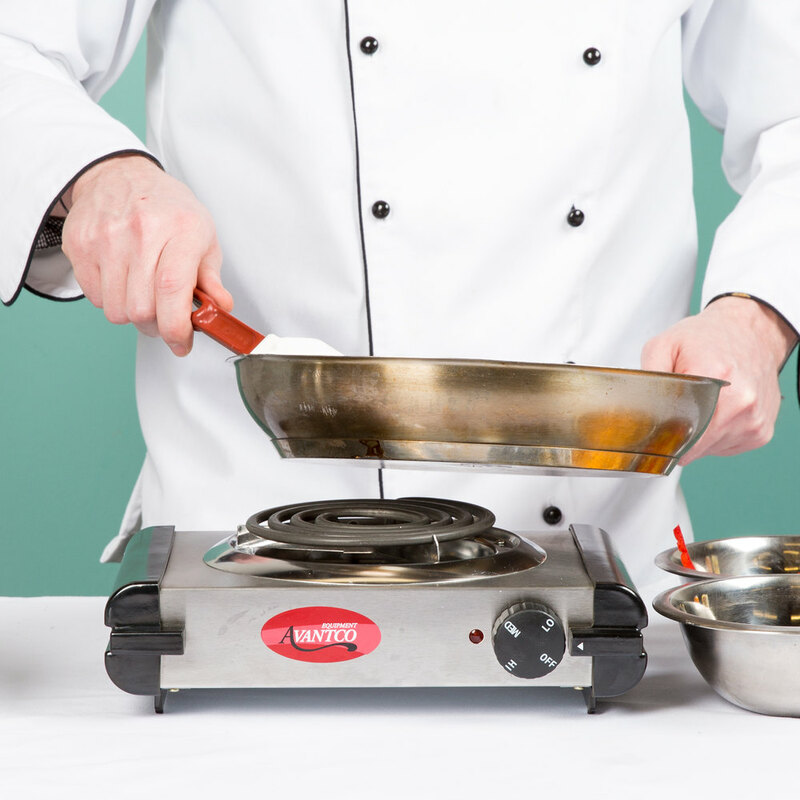 Also, the Avantco EB100 countertop range's self-cleaning heating element and stainless steel drip pan allow for quick, easy clean up after service. We bought it as an extra burner for warming. It is fine for that. You would not be satisfied if you were trying to boil in a large pot. It has a red light that comes on when the burner is heating but it does turn off when it reaches temperature. For safety issues I wish it had an on light rather than temperature light. 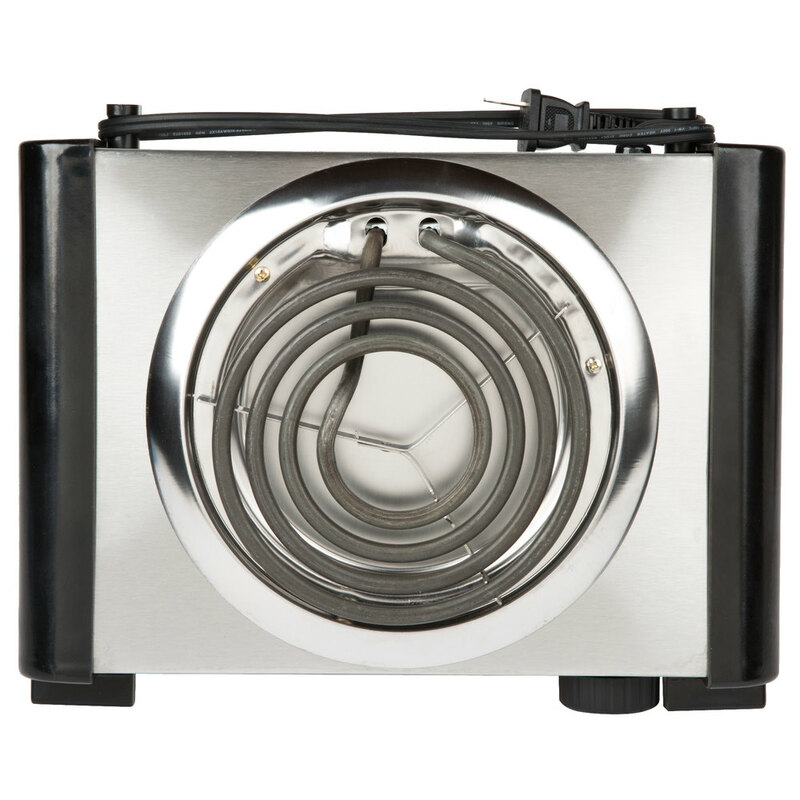 This single burner is very light that it is so easy to cary. I use it for live demo and cooking classes. The surface is very easy to clean. These work great! They take up a limited amount of space and fit almost anywhere. The only down side is if you boil something over really bad it is hard to clean. Not bad for the price. It doesn't boil water too great though, the main reason we bought it. You can't use a pot that's bigger than the eye. We can only do about 2 quarts at a time so making our pasta salad takes a while but it does do it. Saves space in our food trailer though. What a great economical product. We only need to use a burner every so often so having a traditional cook top would be a waste. Just pull it out, plug it in and done. I am an event planner. I had a recent event at a venue that did not have kitchen facilities and i needed to cook a dish on site. I purchased this item to make it easy and efficient. I was able to find a clean place to cook, plug it in and quickly throw it together...was so awesome to have this on hand. 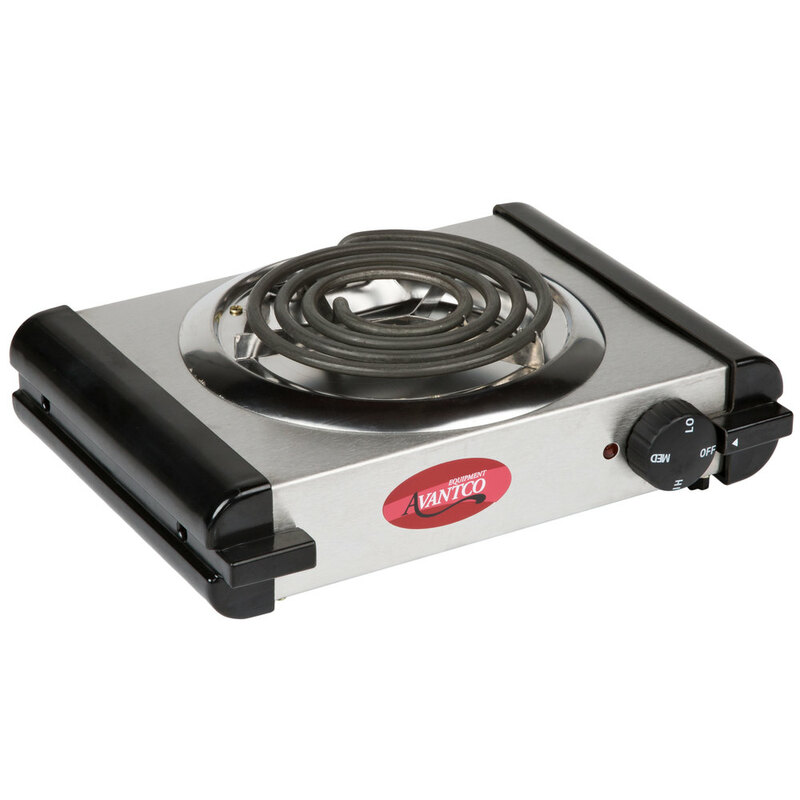 This little burner gets the job done, but electric coil burners are not my favorite choice for cooking. I much prefer a butane burner for consistent heat. 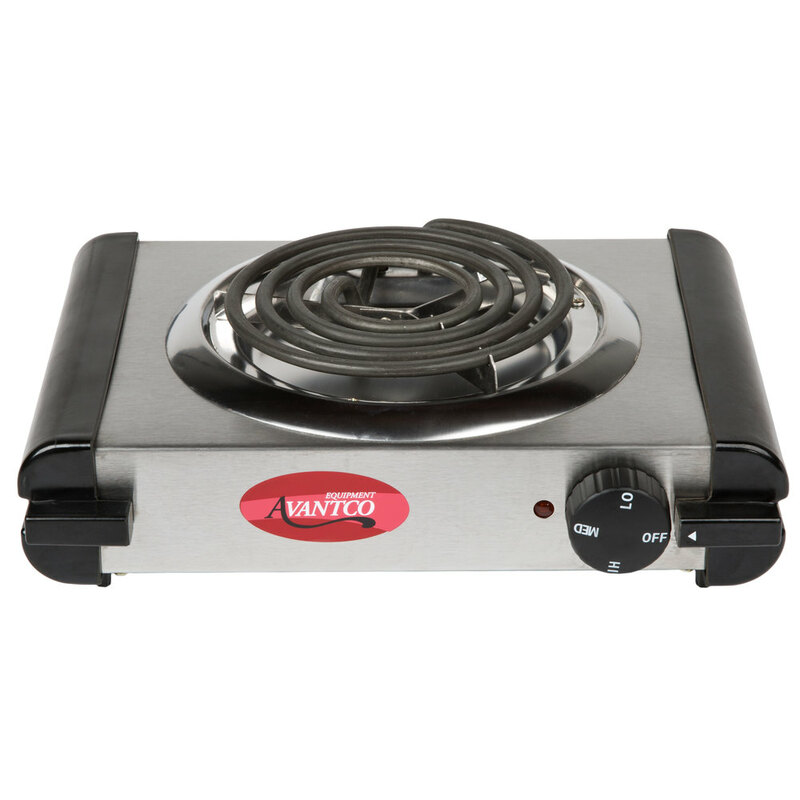 But this burner works OK for boiling a moderate amount of water or cooking grains or heating soup, and it allows me to conserve my butane fuel for sautéing and frying. I've been using this electric burner for two years now and it still works fine, so I'd say it was a worthwhile purchase. We love this product. We needed some extra cooking space besides for our main stove in our kitchen so we purchased this product as an extra cooking range. It's small and compact making it easy to put in small spaced. Very easy to wipe down and clean. The heat levels are great. 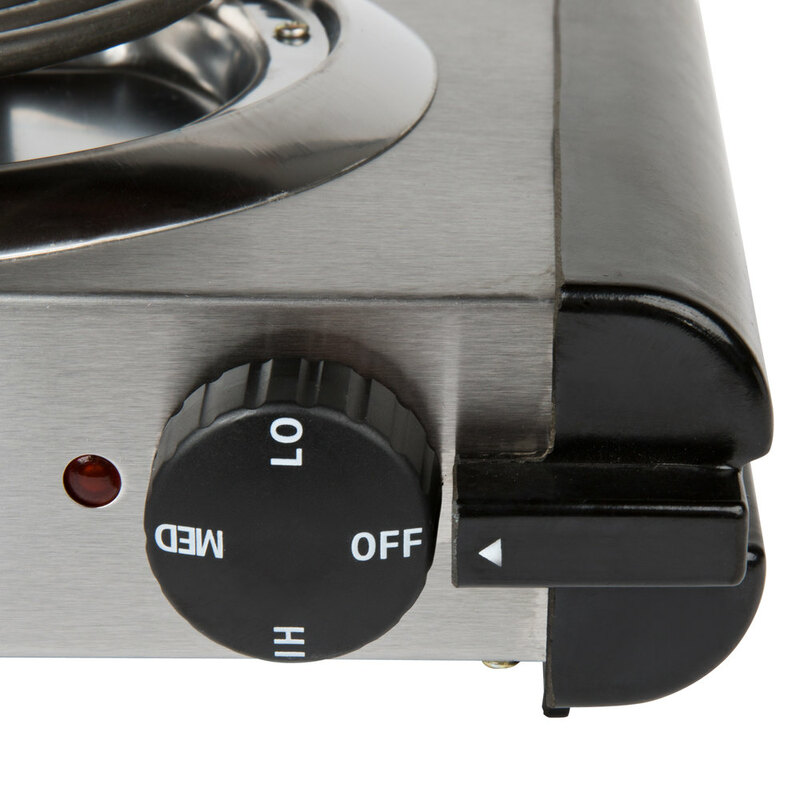 This burner is a bit slow in heating as other reviewers have mentioned. It also is lightweight, but I don't think that's a bad thing. For the specs it carries, it does its job of heating smaller amounts of food. Just don't expect it to boil a large stock pot of liquids, and it definitely won't get hot enough to caramelize sugar even to soft ball stage. we use this burner all the time. light weight but do the job for us. Perfect on the counter top to use additional a burner. The burner was a bit slower than expected. it doesn't get very hot, which is what I need for frying up snacks. I should have purchased the other one with higher wattage. However, if you are in need of medium temps, this will work fine. I love this little single burner for the countertop. The coil heats up very quickly and doesn't use a lot of energy, so for a high-rise kitchen where space (and outlets) is always a premium this 'extra range' is ideal. We use ours for making fish stock or chicken stock in a 6 qt stock pot. And for the price backed by a 'we stand behind our products' customer guarantee, you can't go wrong with this countertop range. Good price. We use this in our deli to make homemade soups for our lunch crowd. Unit was a good fit for the small amount of counter space we have available. I love this item!! Can boil a few quarts of water quickly and it's a nice sized burner. I've cooked a few meals on this now and it's been wonderful! Decent for the price. We don't use it too often and it works for what we need it to. I would not recommend for high volume as it takes a while to heat. I would recommend a butane gas one if you are looking to heat things quickly and use more frequently than once a week. These are a great alternative to gas powered portable stoves! The cut down on the dangers of having an open flame on a buffet line! Cools quickly too!! These burners are really great. I purchased two because I was catering a wedding that has no stove in the facility. I am glad I made the right decision.